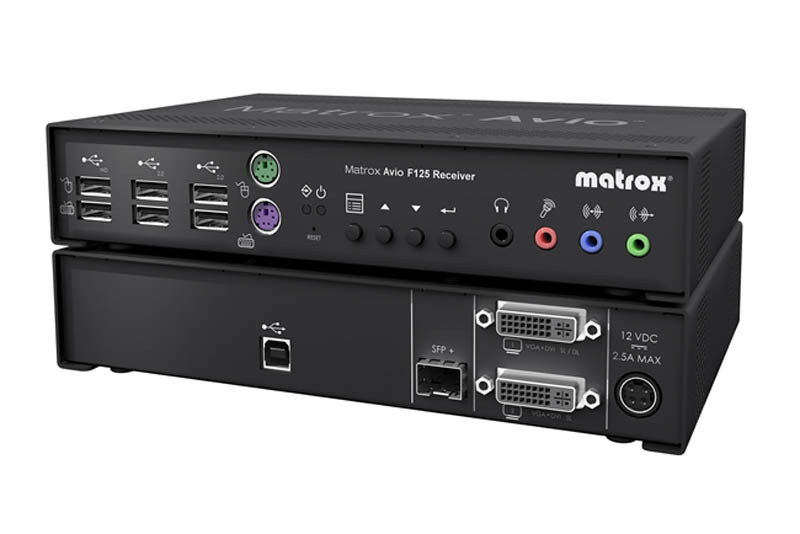 Matrox Avio F125 KVM extenders consist of a transmitter and receiver pair. The Avio transmitter unit captures I/O functionality of the host computer and sends it uncompressed over a single duplex LC-LC fiber optic cable to the Avio receiver unit, letting you separate the computer from the user environment and place it in a climate controlled machine room..
Matrox Avio F125 KVM extenders consist of a transmitter and receiver pair. The Avio transmitter unit captures I/O functionality of the host computer and sends it uncompressed over a single duplex LC-LC fiber optic cable to the Avio receiver unit, letting you separate the computer from the user environment and place it in a climate controlled machine room. Matrox Avio is the ideal KVM extension solution for design, 3D visualization, process control, broadcast, post-production, industrial and military applications where system performance and security are key requirements. Its high bandwidth transmission maintains system performance and does not introduce any latency or dropped frames. Matrox Avio is the solution designed to minimize total ownership cost and maximize performance.